Edit: as requested in a comment below, here's a pic of a pad "stuck on"
We sell sub-ASIS pads, teardrop-shaped pads filled with Synergel, by the pair, in small and large sizes. As you can imagine, they fill anatomical gaps and asymmetry, but also provide extra cushioning, helpful in a variety of situations. Place a pair of pads with the thin ends facing each other on one side of either an Evoflex® or two- or four-point LB (hook and loop compatible, shown as LB in our price list) belt. This provides a soft surface to tighten the belt over the thighs, particularly useful for the elderly or others with fragile skin or significant muscle atrophy. Wheelchair athletes may use SA pads this way too, to avoid skin pressure in activities where the pelvis is repetitively engaged. 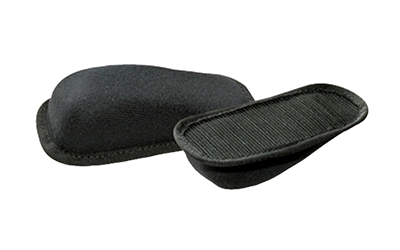 Place a large size pad at the bottom of the Evoflex pad with the narrow tip facing the buckle. This fills a space that can occur between the seating surface and edge of the Evoflex where the pad touches the upper thigh. The sub-ASIS pad makes the Evoflex fit more snugly but comfortably, against the top of the thighs. Sub-ASIS pads are also effective when using a LB four-point belt on a wheelchair user with a flexible obliquity or rotation. If the deformity is flexible, then the SA pad can be placed at the point of the hip for a straighter alignment. The gel pad allows this aggressive positioning, yet provides comfort and safety for the client. Interested in this but a picture or two would be super helpful. I'm not sure I am envisioning it correctly.